Behind the scenes, a lot of mechanical engineering goes into creating and maintaining a tropical rainforest near Lake Erie, just 40 miles from the Canadian border. It is a feat accomplished by Cleveland (Ohio) Metroparks, a recreational authority that provides an “emerald necklace” of woodlands, golf courses, hiking trails and other attractions surrounding this Midwestern city—known as much for its sports teams as its world-class orchestra and Rock ‘n Roll Hall of Fame. Without state-of-the-art HVAC technology, it is doubtful this unique tropical habitat—located within the Cleveland Metroparks Zoo complex—could exist; and it continues to benefit from equipment improvements, such as advanced motor and drive design. The RainForest at Cleveland Metroparks Zoo contains two acres of plants and wildlife similar to that found in rainforests around the world. 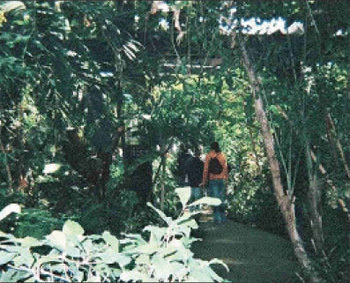 Each year, over one million visitors come to this two-story, domed, simulated biosphere to experience what it is like walking through tropical regions of Central America, Africa or Asia—and see some 600 animals in a natural setting, including birds, monkeys, reptiles, and colorful fish that ply lagoons, swamps and warm rivers. 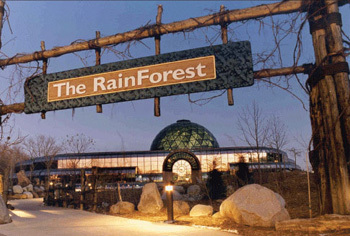 Despite wide swings in temperature and humidity on the Great Lakes, where “Alberta Clipper” storms can swiftly deliver below-freezing temperatures in winter, and sun-drenched summer days top 90 degrees F, visitors and inhabitants of The RainForest enjoy a nearly constant 76 degrees F and 76-percent humidity. This is due to a robust HVAC system that has evolved over the years to incorporate components that have improved the system’s reliability by 100 percent. Not only does The RainForest, a $30 million investment, envelope visitors in exotic surroundings, but it also serves as a reminder of what is being lost—unless more rainforest and jungle acreage can be protected from overdevelopment. Direct Air Systems, Inc., with locations in Cleveland and Columbus, Ohio, working in conjunction with Zesco Inc., specialists in electrical-mechanical motion control and based in Cleveland, provide HVAC service to The RainForest, as well as other notable local sites, including the Rock ‘n Roll Hall of Fame. The RainForest has two air handler units that are 100 percent outside air. 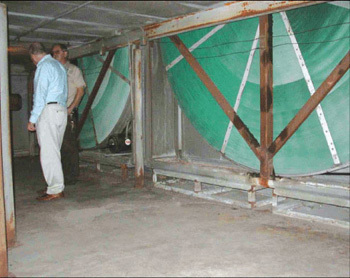 To provide and maintain optimum environmental conditions for the facility, Direct Air Systems installed SEMCO energy wheel systems for the units, one of which has a throughout of 60,000 cfm used primarily for cooling; while the other unit, rated at 40,000 cfm, is equipped with a pre-heater and humidifier rack. Both units have side-by-side,10-foot diameter, 1,000-pound dry desiccant heat wheels, which are necessary to conserve 18,000 pounds of water every day, transferring moisture from The RainForest’s stale exhaust air and giving it to the dry outside air stream once every 2.5 hours. Photo 3. Compact ABB ACS 800 drives, part of the ABB Direct Torque Control solution, require a much smaller footprint than earlier drive models. This is especially helpful in areas where space is limited. The term desiccant refers to material bonded to the surface of the heat wheels that collects moisture, as well as odors, which are then exhausted out of the building via the upper portion of the wheels. The wheels rotate anywhere from seven to eighteen times a minute, depending on the humidity level. Fresh air, referred to as process air, is drawn in on the bottom portion of the air handlers and filters through the wheels. The fresh air’s temperature and humidity are moderated by the wheels’ slow revolution and the fact that the wheels’ mass and desiccant surface transfers a portion of the heat and moisture collected from the interior. Heaters, when necessary, warm the air before it passes to The RainForest’s spacious interior, which has over 60 temperature zones, including those for offices, cafeteria, and gift shops. Rather than being roof-mounted and exposed to the elements, as is commonly done with air handling units, the ones serving The RainForest are built into the facility to maintain unit efficiency that would otherwise be lost in Cleveland’s warm summers and cold winters. The desiccant process was selected for both efficiency and simplicity. It was concluded that boilers, z-ducts, heat pipes or other methods did not compare to the 85 percent efficiency the heat wheels provide. Additionally, heat wheels are extremely simple to operate. The thinking was that the simpler the fundamental mechanical equipment, the greater the reliability and ease of maintenance. That proved to be the case—up to a point. While the technology should have worked flawlessly, a nagging problem developed. Each wheel rotates with a custom fabricated 31-foot long belt and, when first installed, was equipped with a 1-HP ac electric motor rated for 1750 rpm, and a mechanical gearbox to provide a 5:1 gear reduction. At the time of installation, this was a fairly common equipment configuration. However, it was discovered that mechanical gearboxes used for The RainForest were failing at an alarming rate. Once a year, one of the gearboxes had to be replaced. There was no discernable pattern pointing to a particular wheel-and-gearbox arrangement. It was random. The only constant element in the problem was the routine failure of a gearbox. The difficulty was finally identified. It dealt with the revolutions per minute. The pace was too slow for the gearboxes’ splash lubricating systems to engage properly. As a result, parts were not being properly oiled and were wearing out prematurely. Photo 4. More than one million people a year visit The RainForest, enjoying a nearly constant 76ºF, 76 percent humidity environment maintained by the air handling system. Since the use of a gearbox was the common approach when the heat wheels were installed, the issue was not initially seen as one of equipment selection, but viewed as a problem of application. Each heat wheel installation is custom-made and has to contend with its own set of dynamics. Solutions to the problem included continuing the practice of simply replacing gearboxes as they failed; however, it soon became obvious that this was expensive and somewhat unpredictable. Also considered was using gearboxes that lubricate differently, as well as making customized gearboxes specific to The RainForest application. As more thought went into devising ways to handle the lubrication problem, it was concluded that these possibilities were bordering on experimentation. The RainForest, with its 600 animal inhabitants, was not a good candidate to take such risks, especially when a more up-to-date solution was available. 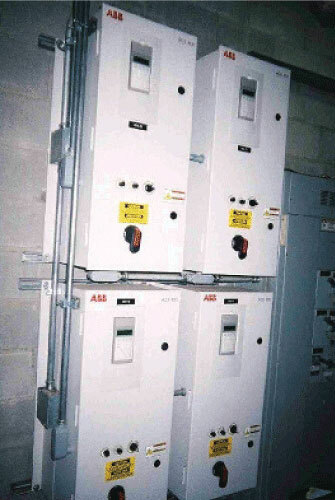 Direct Air Systems thought about their experiences with other HVAC applications and mentioned to the Cleveland Metroparks Zoo maintenance team an ac drive/ac motor solution that did not require gearboxes. This was becoming an increasingly common arrangement and had a good track record. It was also state-of-the-art technology, moving away from the problems and complexities that moving-parts mechanisms presented. The retrofit involved ABB’s Direct Torque Control solution, which uses the ac motor’s torque as the primary control element. The original 1-HP ac motor and gearbox equipment in each of the energy wheel systems was removed and replaced with an ABB 5-HP induction motor/ac low-voltage drive combination. This arrangement allows the motor to be connected directly to the motor/load without the need for a gearbox or pulse encoder. The ABB solution allows full motor torque down to zero speed. Through the use of an algorithm, the ABB drives, in this case variable speed ACS models, can run without an encoder to provide speed feedback. The algorithm enables the drive to calculate the state of the motor’s torque and flux 40,000 times per second. Elimination of the encoder further reduces maintenance and decreases downtime. Although each energy wheel system is controlled by individual Johnson Controls systems, the status of the motors and drives is monitored by The RainForest’s comprehensive Johnson Controls building management system. In the event of a control failure, the ABB ACS drives are designed to go, automatically, to a pre-set rpm rate, to ensure heat transfer is maintained. Spare motors are inventoried at The RainForest and drives are kept at Direct Air Systems’ office location, minutes away from the facility. Through contributions by visitors to The RainForest, and the efforts of other organizations and governments, limited amounts of scarce acreage of rainforests and jungles now are protected from overdevelopment. Continuing support will set aside even more of this valuable land that not only serves as a wildlife refuge for native plants and animals, but also improves the Earth’s environment by taking carbon dioxide out of the atmosphere. Additionally, these protected areas are proving to be important sources for tomorrow’s miracle medicines. Featured on Animal Planet, The RainForest is one of several attractions at the Cleveland Metroparks Zoo, which covers 168 acres and features the largest collection of primate species in North America among its 3,000 animals. Next articleDisconnect, Disconnect, Where For Art Thou? Electrical Systems – Are You Protected? If I were a Manufactured Home, what Code Would I Use?